Available Orphans Sadly, ours is a disposable society. For whatever reason unwanted Akitas are tossed aside, taken to shelters, abandoned on roadsides, or even worse - left chained and abandoned without food or water. "We cannot save them all" has unfortunately become the battle-cry of the many road weary rescue volunteers. Unwanted dogs are arriving at shelters in alarming numbers. These beautiful, loyal animals deserve a second chance at life, and it is the generous hearts of the hundreds that love these dogs that struggle to save them. 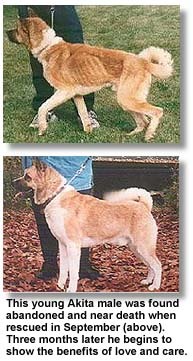 This is what this web site is all about - Akita Rescue - and this section of the site is built to offer services to the many organizations working to place these dogs, and to showcase available orphans looking for homes. The directory at right will lead you to various sections depending on your needs and interests. Please be sure and take a moment to visit the orphans to see the many beauties needing a second chance.